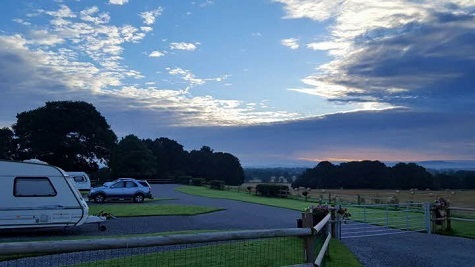 Welltrough Hall Farm is situated just outside the village of Lower Withington in the beautiful Cheshire countryside. 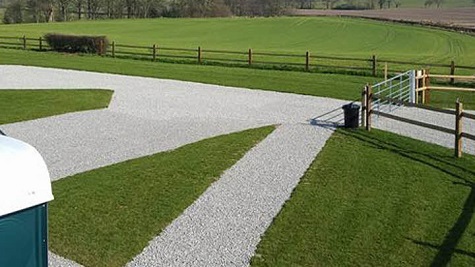 The site offers peace and quiet with stunning views overlooking our 270 acre farm and beyond. We are an adult only site with dogs welcome providing they are kept on a lead. 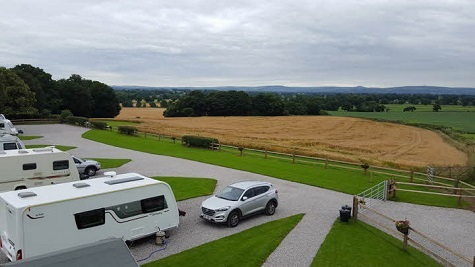 The pitches are hardstanding, spacious and generally flat with great views and all have 10 amp electric hook ups, water and a grey waste drain. 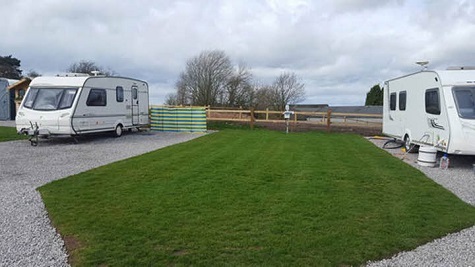 There is a shower, toilet and elsan emptying point on site as well as a well stocked information shed which also contains a coin operated washing machine and tumble dryer. We have a 3km mown grass walk around the farm with numerous bins for dog walkers. A free dog shower is provided for cleaning those mucky paws when back at the site! There is also a public footpath that runs through the far field on the farm as well as numerous walks in the area. 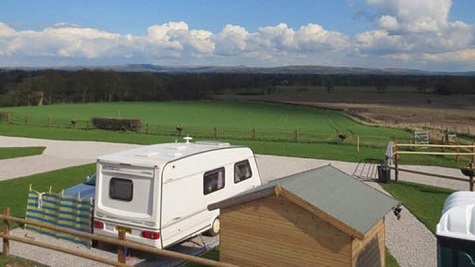 We have fully serviced pitches. There are two pubs within a short walk, both providing good food. 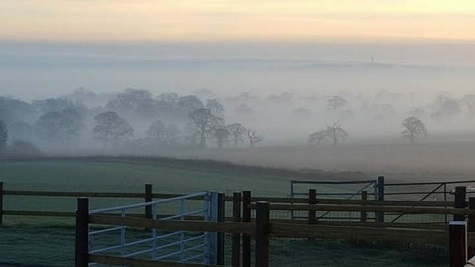 Our site is well positioned for easy reach to local shops, banks and eating out with Congleton, Holmes Chapel, Knutsford, Macclesfield and Alderley Edge all a short drive away. Other places to visit include Jodrell bank telescope, Tatton Park, Redesmere Lake, Little Moreton Hall, Arley hall and gardens plus much more! For more information or to book please visit our Website. You can only find us on Facebook. 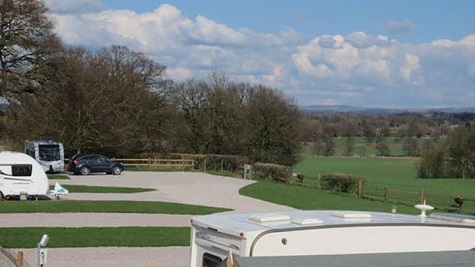 Facilities : Adults only, Electric hook up available, Easy access, Suitable for Caravans Motorhomes and RVs, Hardstanding Serviced pitches, Toilet, Shower, Laundry facilities, Scenic views, Wi-Fi, Dogs allowed, Rally field available, TV reception good. CL come campsite with terrific views from just about every pitch. For £20pn you can’t go wrong .. fully serviced pitch with WiFi and a choice of 2 dog walks . We’ve been twice and have a third booked , it’s over a 4hr drive for us and it’s worth it. 2 elsan points and 2 porta showers for 18 vans .. fantastic. How can this be a CL? 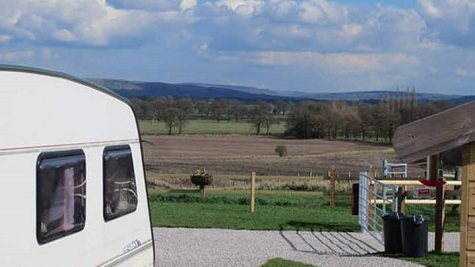 This is a lovely and well maintained caravan site though with few facilities for the 24 or so hard standing pitches. Clearly from the photos on the web page it was once a CL but recently has been extensively expanded so if members are looking for a 5 pitch CL then this will not fit the bill. We chose this site based on it being a 5 pitch CL with facilities so we were very disappointed. Really Lovely but is it a CL site? We have visited this site a few times and it is well laid out, very quiet and has absolutely stunning views from nearly every pitch. There is a good farm walk on site and lovely sense of space overall. We didn't use the portaloo or showers and agree with another reviewer that £20 is enough to pay per night so shouldn't really have an extra charge for a shower. It is a site we will use again but do have an issue with it being called a CL site. There are approximately 20 + caravans on site, broken into different sections but nevertheless larger than you expect if you think you are going to a CL site. Is this a Caravan Club issue as they have obviously approved this classification, but it is misleading? We only ever use CL sites and purposely want to be based at smaller 5 van sites, this isn't one of those but is lovely in many other ways. This is a superb CL immaculately kept and with great views for six miles or so across the valley. We watched Lapwings swooping and dancing across the fields each evening. We could even see Jodrell Bank telescope in the opposite direction. We found the WC and shower to be clean and adequate, housed in a plastic WC pod and shed. The site even has a washing machine and tumble drier! This site is so well kept that I would rate it as one of the bets CL’s we have ever stayed on. For all of our three night stay it was very quiet and peaceful helped no doubt by the fact that it is an Adults only site. Being retired we have had our turn of noisy kids! We found Nick to be a very helpful and pleasant person. However being a Farm site the entrance drive and way through farm buildings can get a bit muddy and uneven particularly when its wet. This site was a delight from booking to arriving and for the duration of our stay, which sadly was only one night, Nick confirmed our booking and gave helpful tips on finding his site. Upon arrival it was clear where we should pitch and the views were breathtaking, we were blessed with some good weather which showed it off to its best. Our first task was to exercise our dogs and to our delight there was 3k a walk all around the farm that had been designated (with poo bins a plenty) There was a toilet facility and shower which my husband take advantage of and said it was super, lots of hot water, a place to put your clean clothes and all in all a fabulous site. Our pitch overlooked Jodrell Bank in the distance which was interesting. easy access from the M6 for our onward journey to the lakes. we will be back Nick! We used this site for a breather, on the way to the lakes, from E.Anglia. To say we were impressed by the site is an understatement, as we arrived. Views from the pitches, were brilliant, and spacing, although not secluded, was enough to give separation. The farm walks take in some lovely views, and we went round quite a few times while there. Toilet and shower are basic, but adequate. You can get two done in the shower, for the same coin, so double up, with changing and showering in turn. Locally, for us the walks were great, although the nearest pub to the site,( Red Lion ), did not accept dogs, and the host was far from amenable, when we visited. There is a far better reception/ale/dog friendly/food quality place within 3 miles that has been pub of the year. So head for the Swettenham Arms. ( The short cut down to the ford, is the best option as you approach, so look for the signs ) We WILL use this gem again. Directions : From Holmes Chapel take the A535 towards Jodrell Bank. After about 2 miles in Twemlow Green turn right down Forty Acres Lane signposted Swettenham. After about 2 miles turn Left at junction with Long Lane signposted Lower Withington. Site on right in about 300 yards. Proceed along Farm Drive to the site. If following SatNav do not turn up Trap Street. Farm entrance on junction.